Why are companies expanding their data governance capabilities? A few weeks back I attended the Information Management webinar, Data Governance: A vitamin for competitive advantage,along with a few hundred other people. 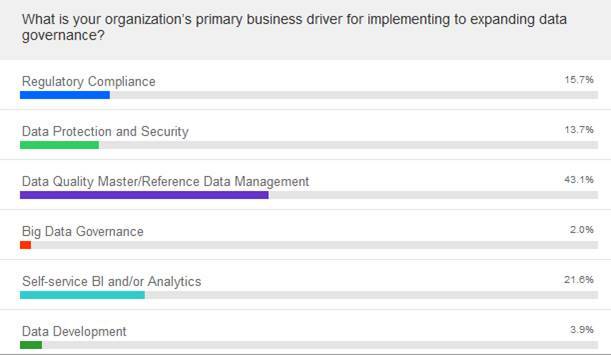 As can be seen from the chart, master data and data quality initiatives are by far the biggest business driver, with data analytics a close second. This webinar with Bob Seiner will address how to improve data quality through the application of Data Governance practices. Quality starts with a plan and requires formal execution and enforcement of authority over the data. Attend this webinar and take away a plan to achieve data quality through Data Governance.